bla. bla? bla! 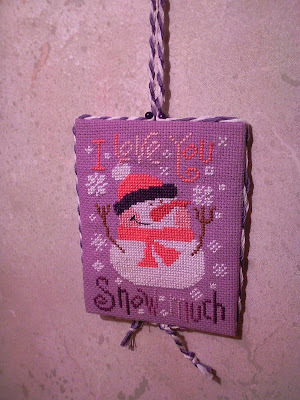 : I love you snooooow much! You remember my snowman that I started back in... hmm.. let me see.. September? Poor thing couldn't make it for Christmas, actually it couldn't make it for New Year's either - it still had one lousy snowflake to go! I think I might get addicted to this form of finishing ^____^ It's a good place t thank again Cat who sent me some months ago the cord making tutorial. I tried it finally and was amazed how easy it was! The floss colours are a little weird because while traveling forth and back to home with the project (without putting a single stitch of it for months), I lost (or at least I thought so) the floss. 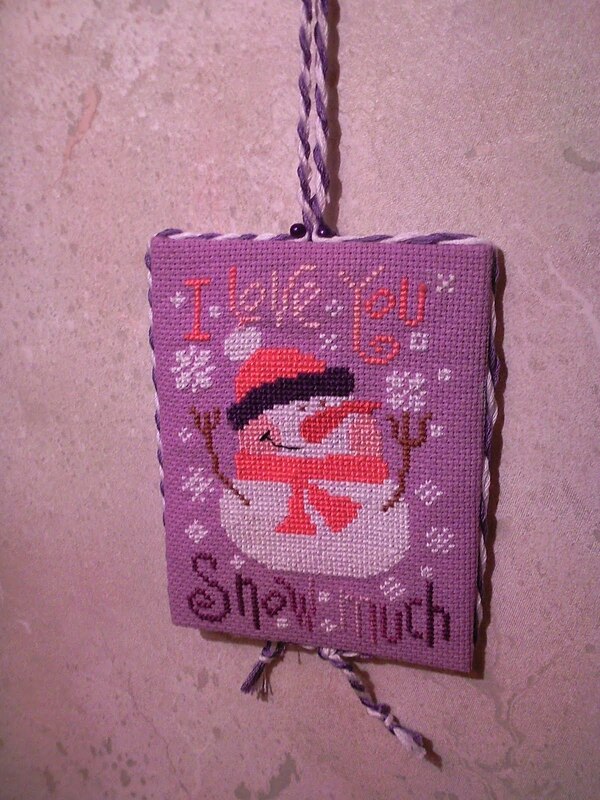 Of course after finishing it, the purple varigated thread was found >.> Btw that tiny snowflake in the right upper corner next to the U didn't let Mr Snowman to be last thing stitched in 2010. One mean piece of frozen H2O. А малката снежинка горе до U-то е същата, виновна за несбъднатите мечти на снежния човек. Съдбата е жестока, снегът също. А заплашват, че сега ще вали... бррр. "С Капчица го залепи, после ти не му мисли!" 2 януари 2011 г., 16:01 ч.
Много хубав е станал снежко! Поздравления! Честита Нова Година!Щастие и много късмет! 3 януари 2011 г., 6:09 ч.
Lol it turned out really cute! Sorry that one snowflake held you back from fishing it in 2010. What kind of glue did you use? Do you have 'Allenes Tacky glue' over there? That's what I use and it works pretty good. 3 януари 2011 г., 8:15 ч. 6 януари 2011 г., 13:59 ч.